One of the great things about Paflyfish is the tremendous knowledge and sharing that is done especially in the forums. Tom "afishinado" Ciannilli, like many, regularly contributes to answering questions in the Beginners Forums. 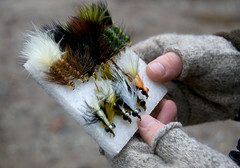 As the early trout season is about to get started he offered some great advice on A Dozen Top Flies. A very subjective topic, but for anglers just getting started, Tom's picks are are spot on. Tom's selection is broken into six sinking flies for subsurface fishing and six surface dry flies. For some flies a range of sizes are important to have your fly box. The selection and success of fly and size will always depend on stream and conditions. I would suggest having more than about three of each of these to get started. Nothing worse than having a successful day with a fly and then not to have a backup if you loose it. For any fly fishing angler starting to fill out their fly boxes these 12 types of flies will get you started on most any water for several months. You can join along with further questions in Tom's thread here in the forum. Wooly Bugger – Size 8 in dark olive w/ a black tail is my go-to. Having some black or white ones and a few a little smaller or bigger would be ideal. Fish anytime / anywhere – drift and/or strip. Soft Hackle – Size 12 – 16. Pheasant tail, Partridge and Orange, Partridge and yellow, peacock to name a few popular ones. Dead drift, swing, hang or strip. All will catch fish. Elk Hair Caddis – Size 10 – 18 in Tan, Black and Green for caddis hatches and/or stonefly hatches all season. Mayflies have an upright wing and look like sailboats on the water. Caddis have wings shaped like a tent over their body. Stoneflies have wings that fold flat over their bodies.